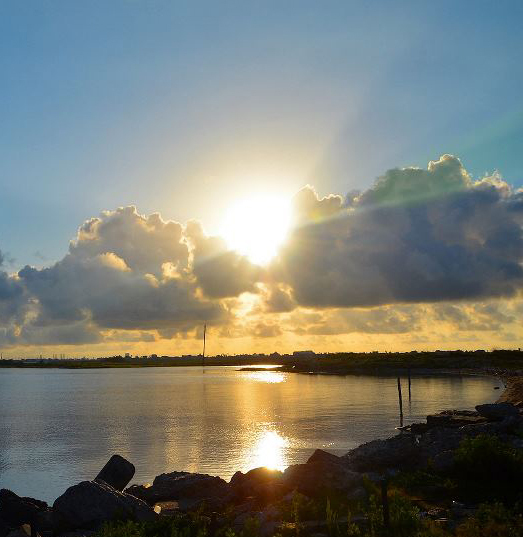 The beauty God created gives us a tiny glimpse of Heaven and leaves us in total awe. Even more awesome is we can live in peace and tranquility knowing He gave His only son for us. HAPPY EASTER! Rejoice, CHRIST HAS RISEN! Let’s get going on that sky! My color mixtures are shown above, the recipes are as follows. #1. MUD (2 parts Ultramarine Blue + 1 part Alizarin Crimson) + White. #2. MUD +Alizarin Crimson + White. #3. Mix #2 + Cadmium Red Light + Alizarin Crimson. #4. Cadmium Red Light + Cadmium Orange + a touch of mix #3 + White. #5. Two shades of Cadmium Yellow Medium + a bit of Cadmium Orange + White. #6. Cadmium Yellow Medium + White. #7. 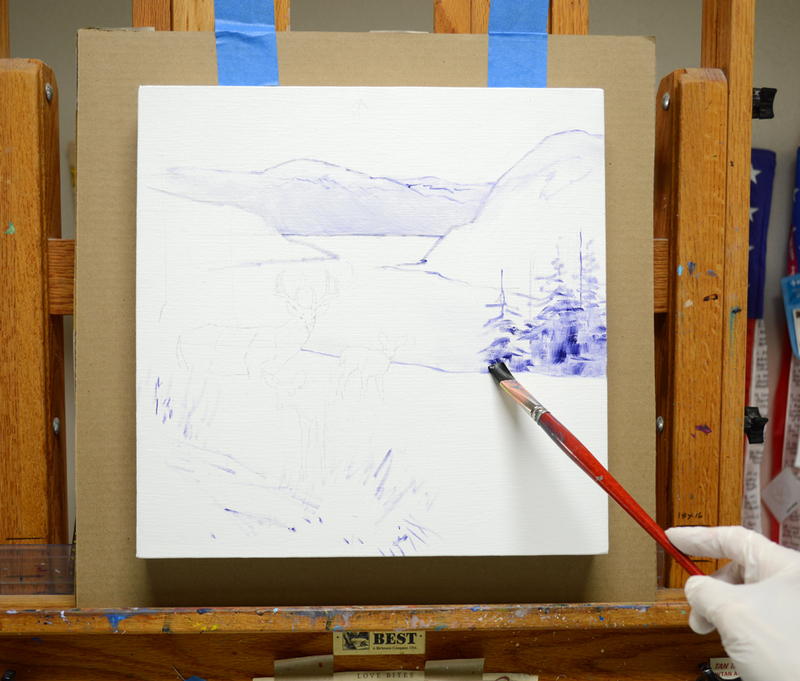 4 combinations of MUD + Ultramarine Blue + White for the mountains. By the way, if you ever need to mix Cadmium Orange just combine 2 parts Cadmium Yellow Medium + 1 part Cadmium Red Light! VIDEO DEMONSTRATION: Sky and Mountain. Paint from the sky is used to make the reflections from the setting sun in the still water below. Some of mixes #3 and #4 are brought in behind the buck’s head to accentuate it. Please remember, you may click on any of the pictures to view enlargements. After bringing some lighter reflections in back of his majestic rack with the darkest #5 mix, the antlers are drawn into the wet paint with some MUD + Liquin. 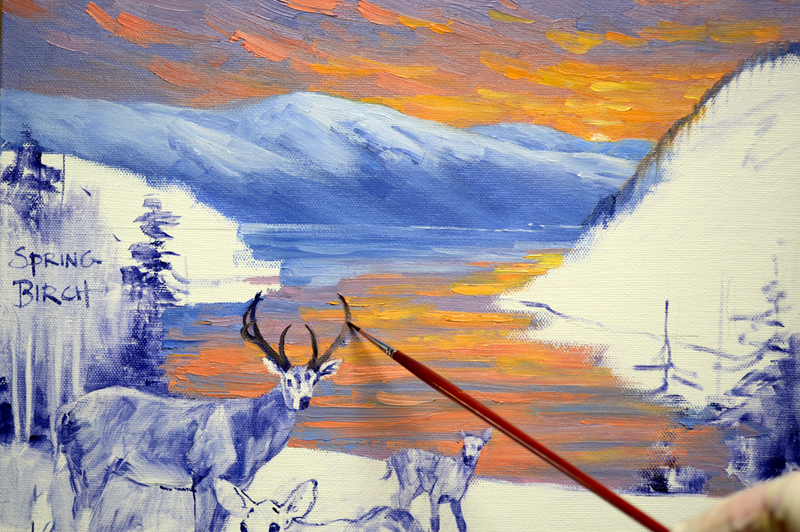 The lighter streak in the water serves to lead the viewer’s eye from the sun to the deer. Tree tops on the mountain glow with warmth from the sun’s rays. The corner of my square “Bright” brush is used to delineate the details. 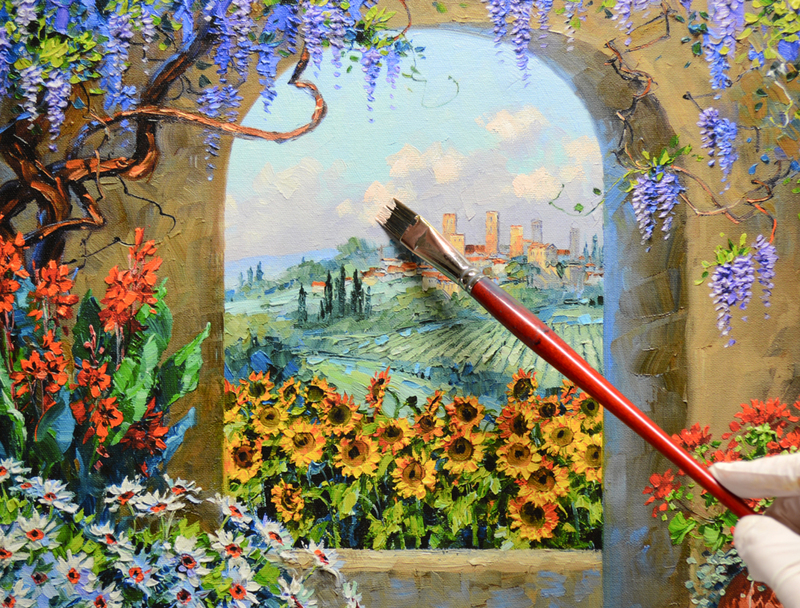 To learn more about the brushes I prefer, CLICK HERE. 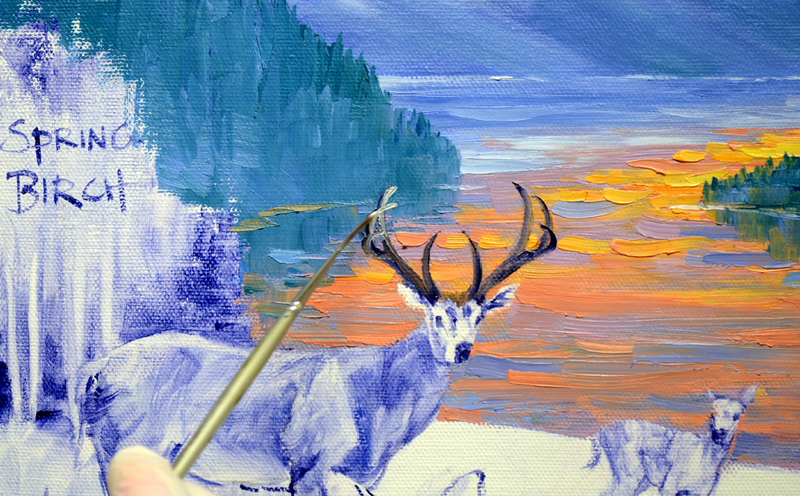 The tips of the buck’s antlers are also highlighted by the setting sun. 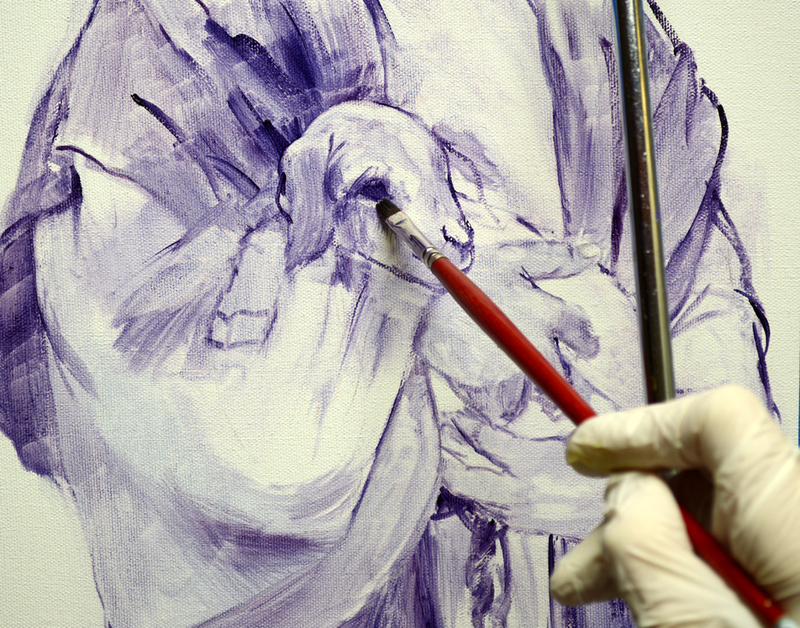 Today I’m starting a new commission based on one I had previously painted for my collector. Jeana and her sister, Belinda, grew up enjoying the Finger Lakes in Upstate New York. 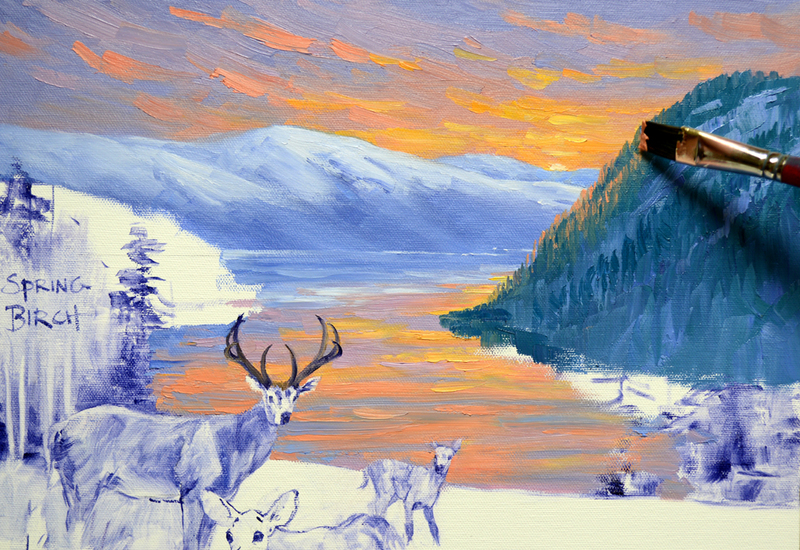 The painting shown above was done for Belinda’s Christmas gift last year. 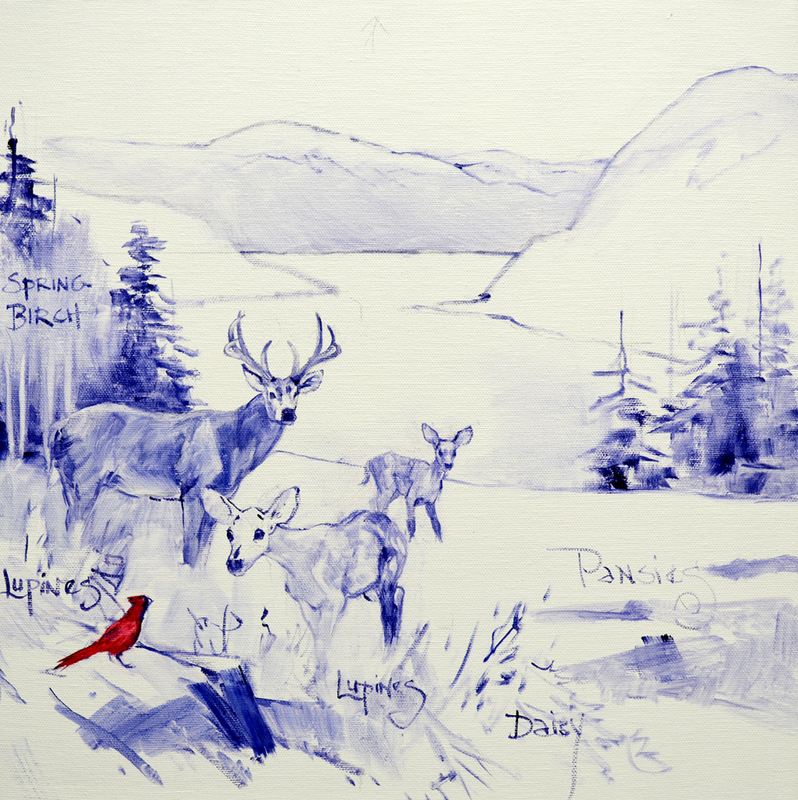 This area is filled with such wonderful memories for Jeana that she asked me to paint a similar piece for her. 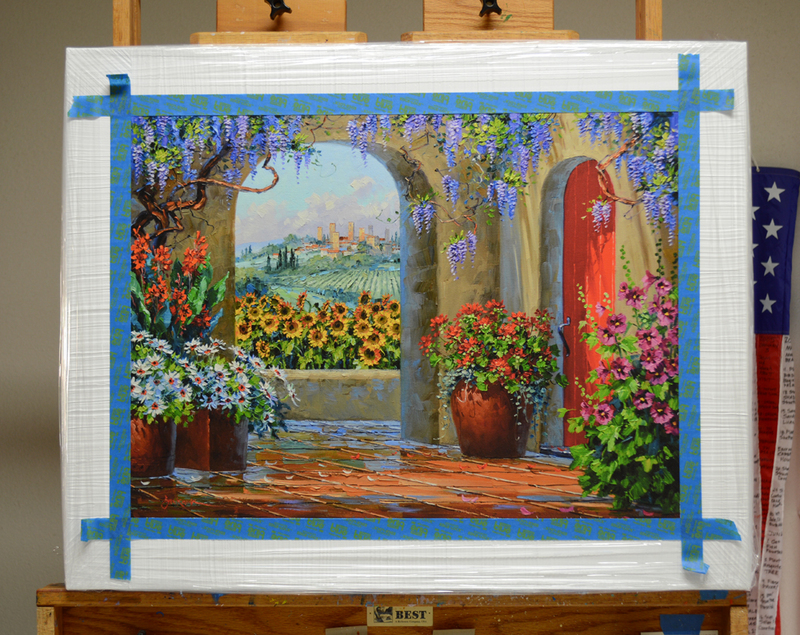 The painting is 14 inches by 14 inches on a gallery wrap canvas, the painted image will extend over the edge and onto the sides. The canvas is attached to a piece of double ply cardboard. To see how this is done, CLICK HERE. 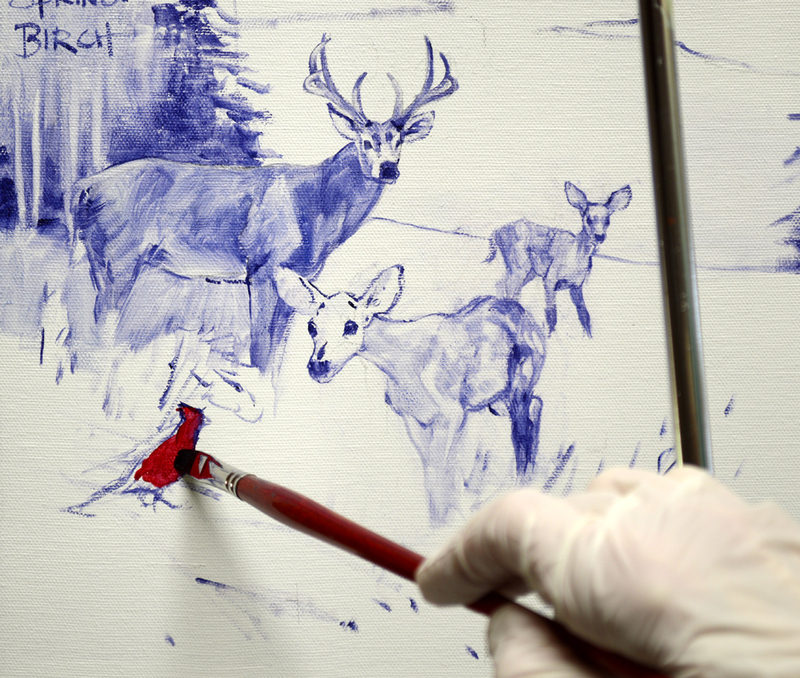 After penciling in the shapes of the deer in the foreground I begin drawing the basic elements of the composition with a brush dipped in a thin oil wash of MUD (2 parts Ultramarine Blue + 1 part Alizarin Crimson) + Liquin. You may click on the image to see it larger. A large buck and two fawns are in the foreground. My wrist is braced against the mahl stick to steady my hand as I draw his rack. Now the fawns are drawn with a brush dipped in the MUD wash. The curious fawn is investigating a Cardinal perched on an outcropping of rocks in the lower left corner. He is washed in with Alizarin Crimson + Liquin. Flowers are labeled and we’re ready to begin painting in our next session. Please come follow along! If you would like to receive an email every time I publish a new post please feel free to subscribe to my blog. CLICK THIS LINK and scroll to the upper right side of the page. You will see a heading EMAIL SUBSCRIPTIONS. Just enter your email address and click the button “Sign me up!” It’s easy. 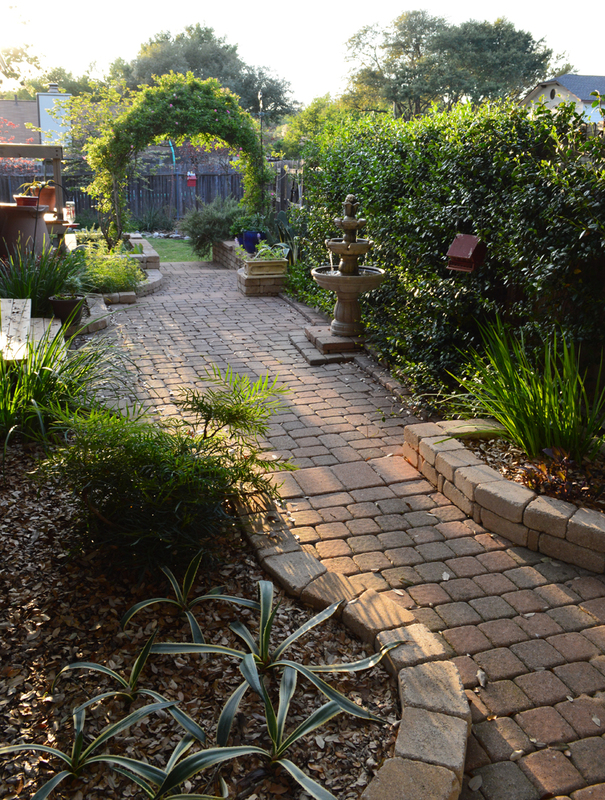 Since I’m working on some Surprise commissions I’ll share a few pictures of our Spring Garden. 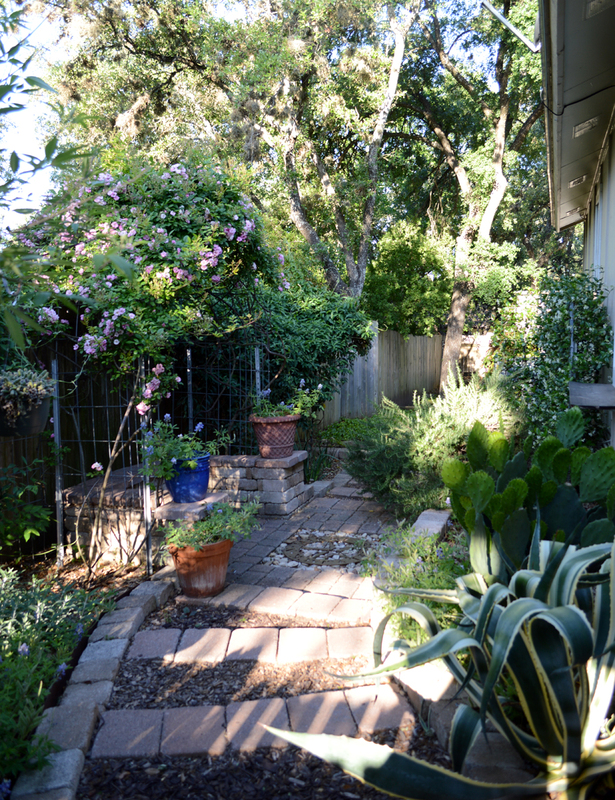 The Red Yucca, Rock Purslane and Aloes in front of the studio are in full bloom, attracting lots of Hummingbirds! As you go through the blog please keep in mind, you may click on any of the pictures to see them larger. 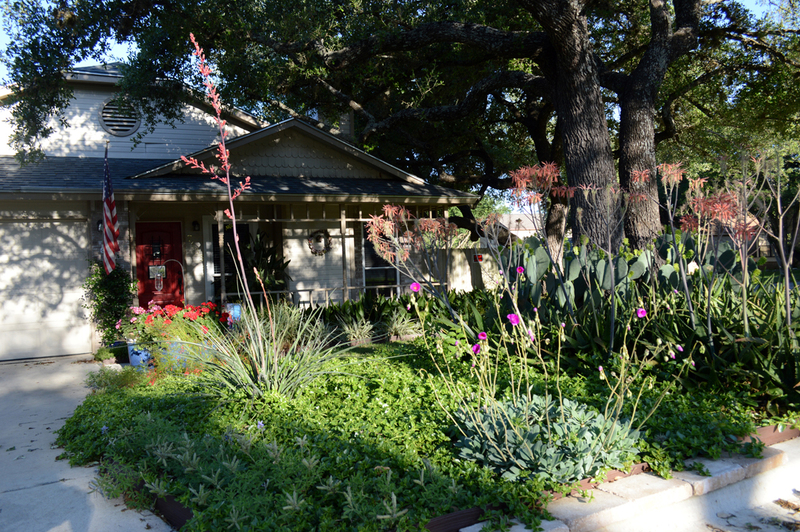 Geraniums and Bluebonnets provide a HAPPY greeting! 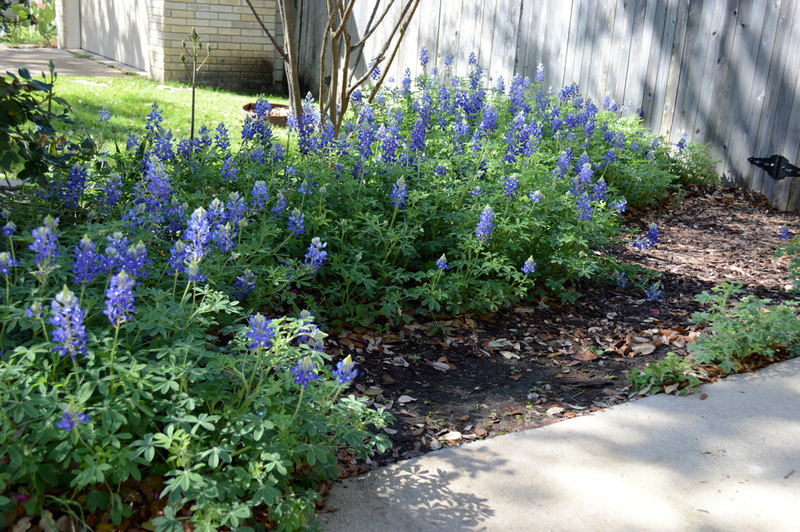 More lush Bluebonnets lead the way from the driveway to the side gate. Which opened reveals our little Kitchen Garden. 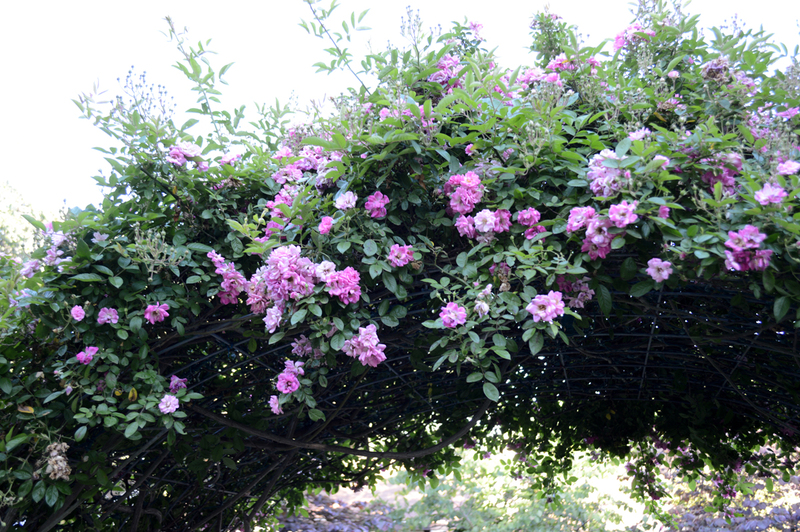 The Rose Arbor can be seen from the kitchen window. 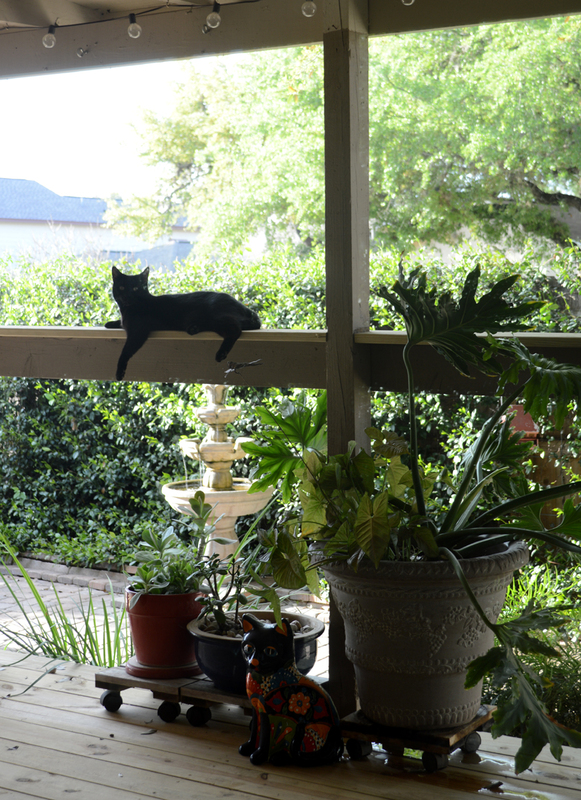 Just beyond the cactus on the right side, Star Jasmine is planted right outside that window. The beautiful fragrance fills the house this time of year. 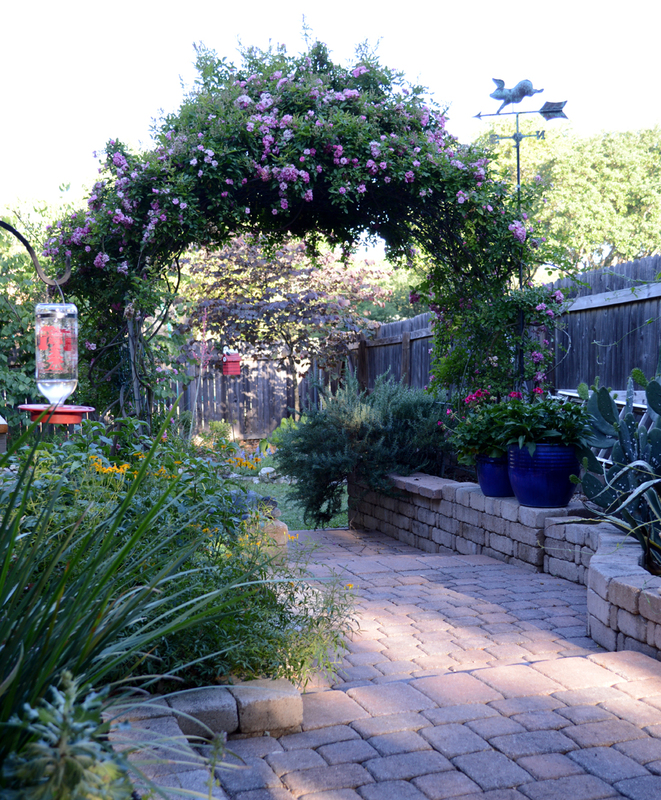 Here’s another view of the Kitchen Garden from below the Rose Arbor. 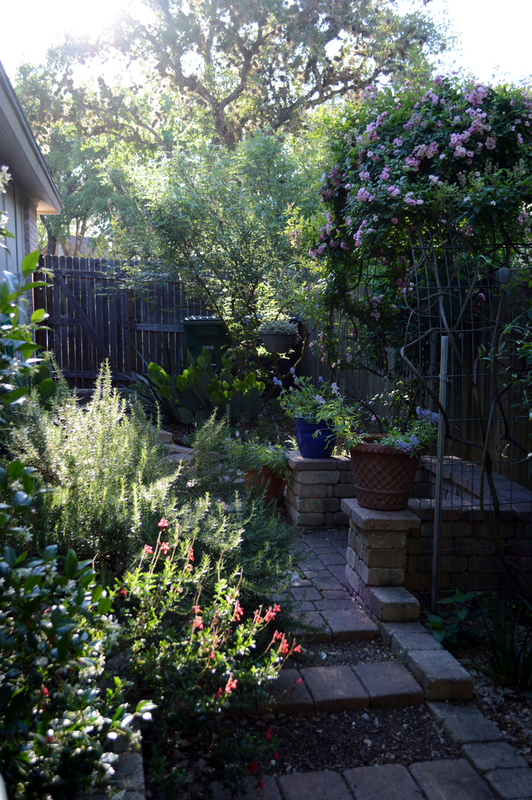 The Star Jasmine is directly on the left next to Salvia Greggi and Rosemary. Coming around the back of the deck you can see the “Snoopy” Garden with the Red “Snoopy” birdhouse in the distance. 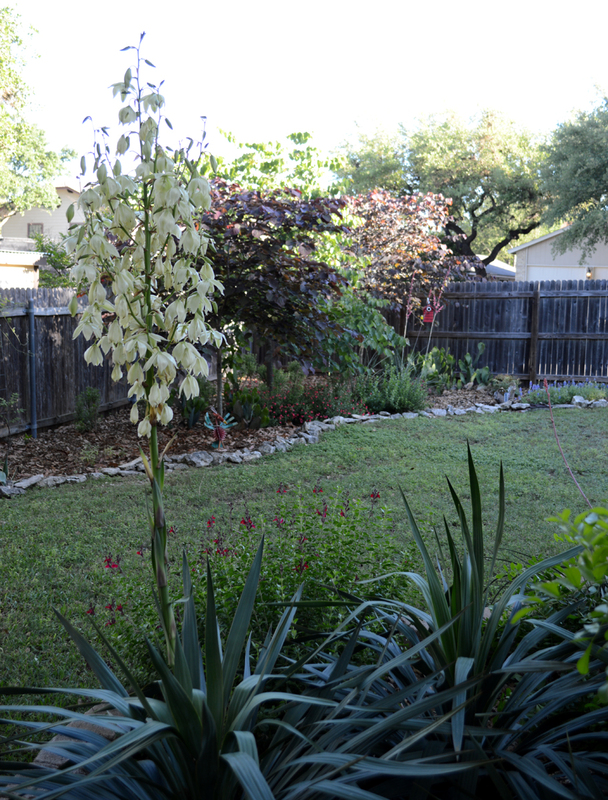 I’m super excited, the White Soft Yucca has never bloomed before so this is a special treat. 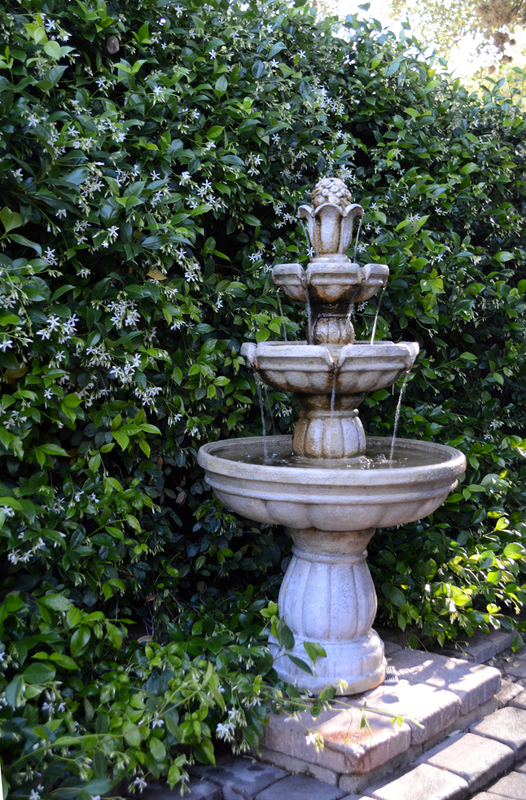 A second Rose Arbor, on the opposite side of the studio, provides a entrance to the Fountain Courtyard. You can see “Snoopy” in the background. The tiny wren babies I mentioned in a recent blog have grown up and flown away! These are “Peggy Martin Roses”, they have no thorns which is really wonderful when pruning time comes! The mother plants survived under ocean floodwaters for nine days after Hurricane Katrina in New Orleans. Since they are so tough a commercial grower decided to propagate the roses and offer them for sale in nurseries. More Star Jasmine grows on this side. It’s wonderful to sit on the deck in the late afternoon and take in the delightful scent. Molly and her pal Bosco, the talavera ceramic kitty, are certainly enjoying! 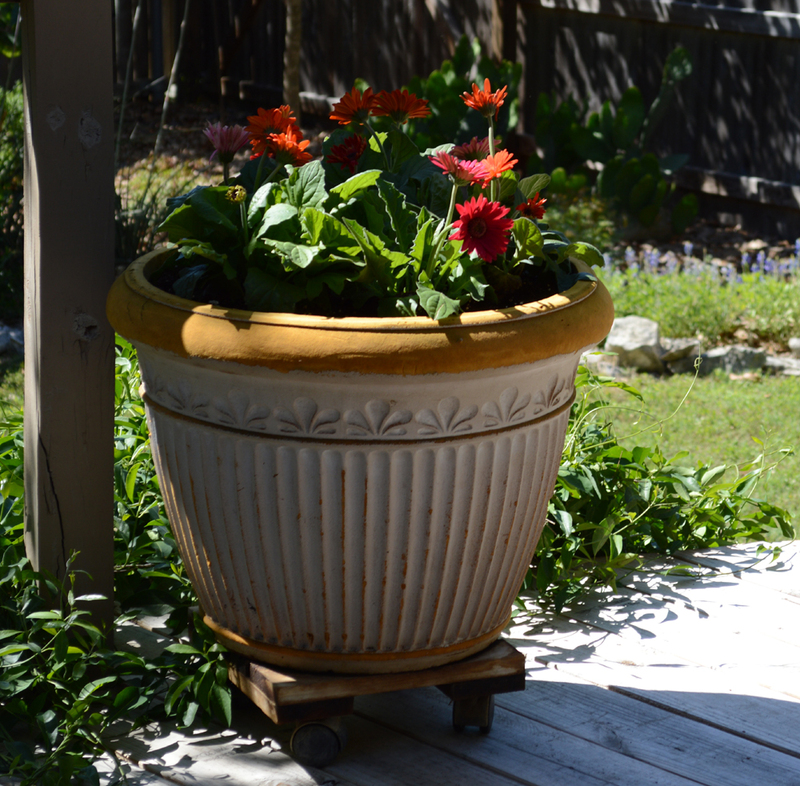 Gerber Daisies are some of my favorites, especially since they love our hot summers here in Texas. First the background is painted with mixtures of Pthalo Blue + Cadmium Orange + MUD (2 parts Ultramarine Blue + 1 part Alizarin Crimson) + White. Then the dark, heavy outer robe is blocked in with mixes of MUD + Cadmium Orange + more Ultramarine Blue + White. Please remember as you read through my blog, you may click on any of the images to see them larger. The creamy white linen robe is rendered with combinations of White + Ultramarine Blue + a touch of MUD, White + MUD + a bit of Cadmium Orange, White + some of the darker robe color and White + a little Cadmium Orange + a hint of Ultramarine Blue. The highlights on the sunlit folds are just a lighter version of the cream mixture. I want to reserve pure White for the accents on the Lamb. 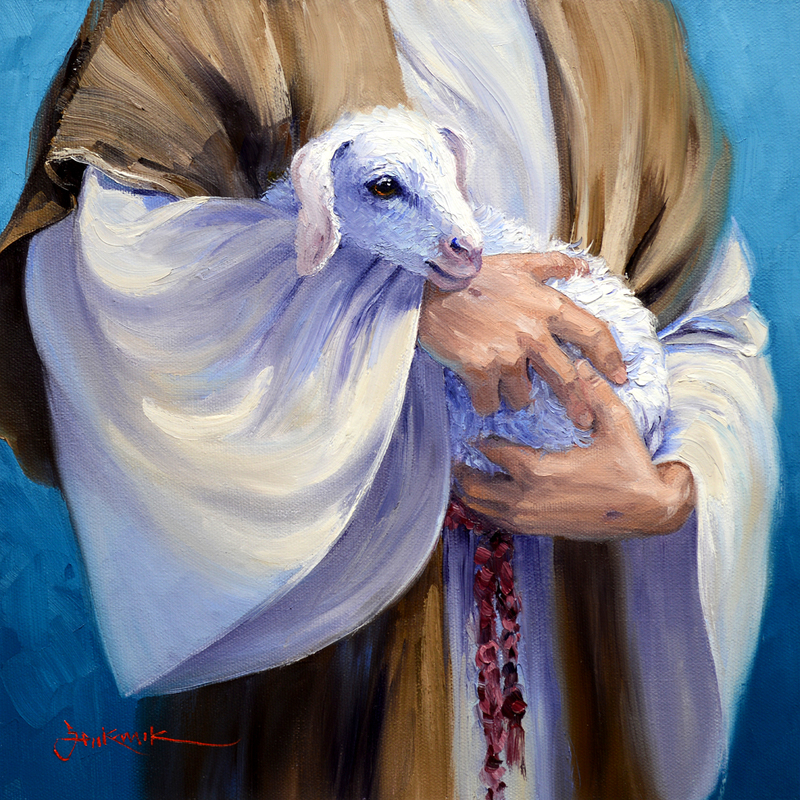 The Lamb’s front legs drape over Jesus’ arm. His tiny hooves are made of Ivory Black + White. 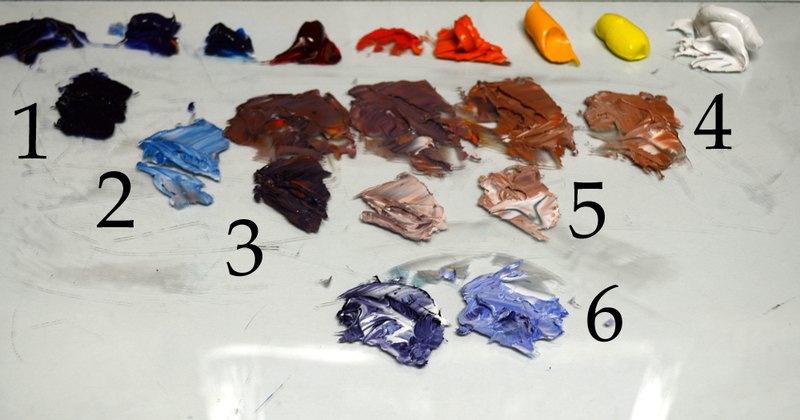 The color mixes for the skin tones are shown above. #1. MUD + Liquin. #2. Cerulean Blue + White. #3. MUD + Cadmium Orange + White. #4. Four combinations in different proportions of MUD + Cadmium Orange + Cadmium Red Light + White. #5. Two shades of White + a little Alizarin Crimson + #3. #6. A light and dark mix of Ultramarine Blue + MUD + White. 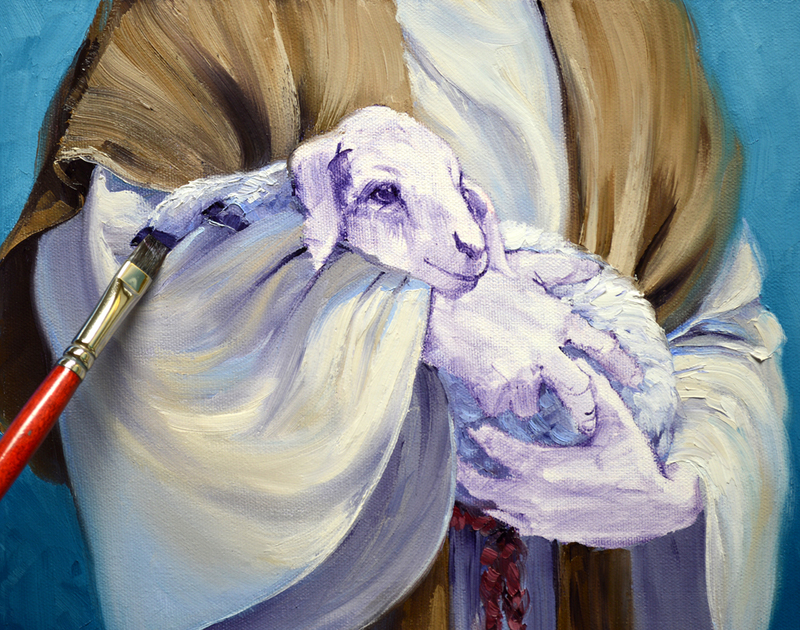 After studying the painting I realized our little Lamb looked kind of uncomfortable with his front legs extended over Jesus’ arm, almost like he wanted to escape. SO……I paint out his legs. 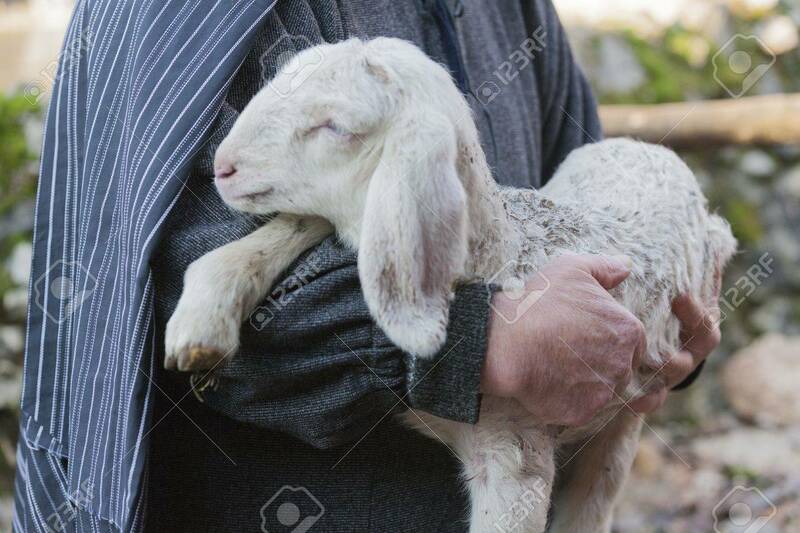 I want the sweet baby to appear more snuggled; safe and secure in his Good Shepherd’s arms. I’ve been working on some surprise commissions so I’ve not posted a blog for a couple of days. This piece is one of those secret ones, it’s a baby gift for the Pastor of my church and his wife who recently had a precious little boy! The gift has been given so now I can reveal the painting process. Here’s a couple of the pictures I used for reference. Both of these were found on Google.com. 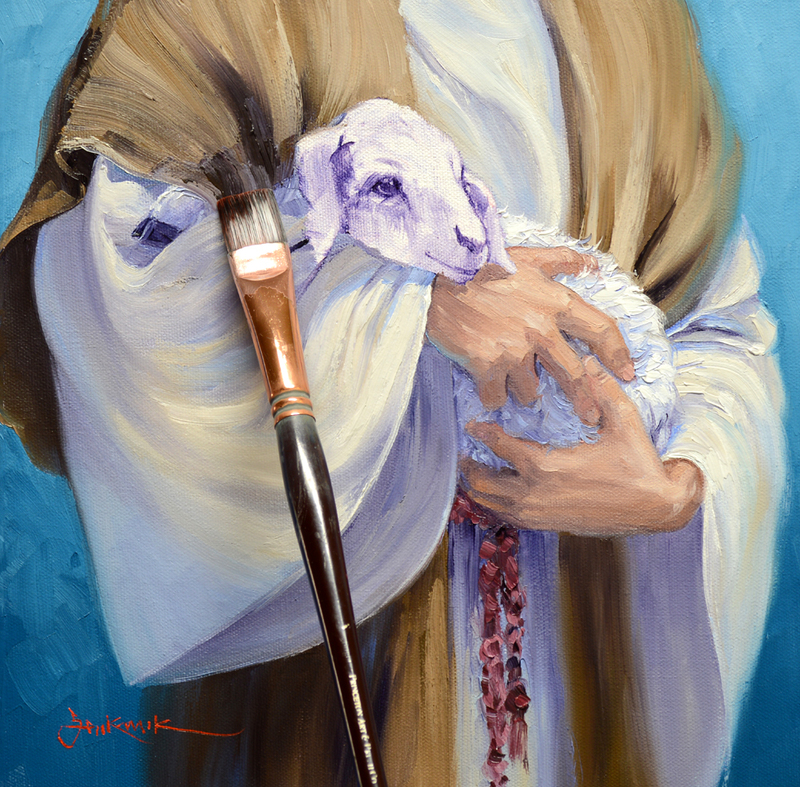 My theme for the gift is “The Lord is My Shepherd”. 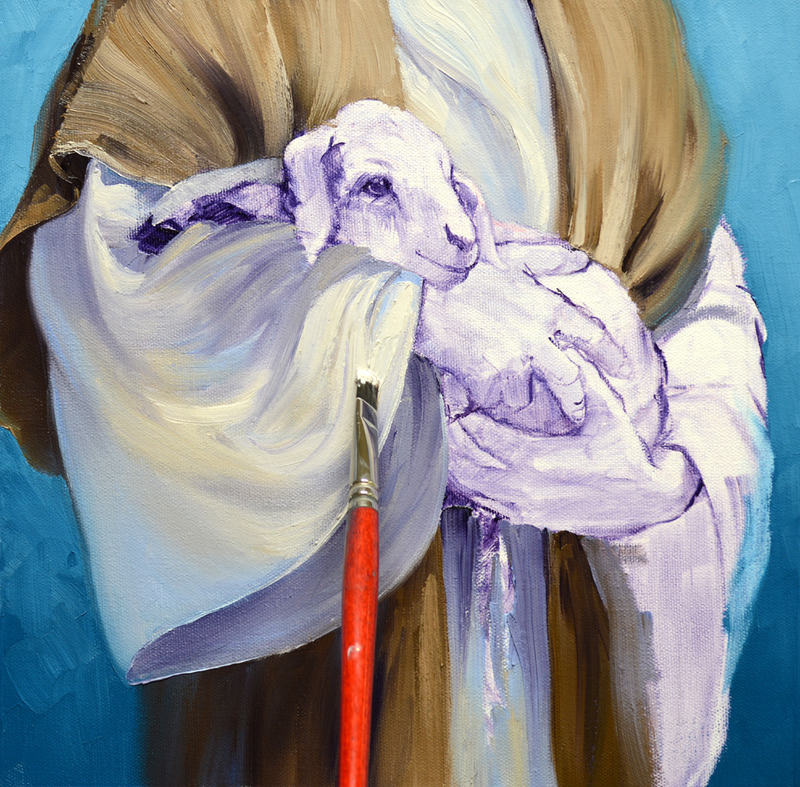 Instead of the piece being a portrait of Jesus, my intent is to portray the wonderful feeling of the comfort that being in His Arms gives us. 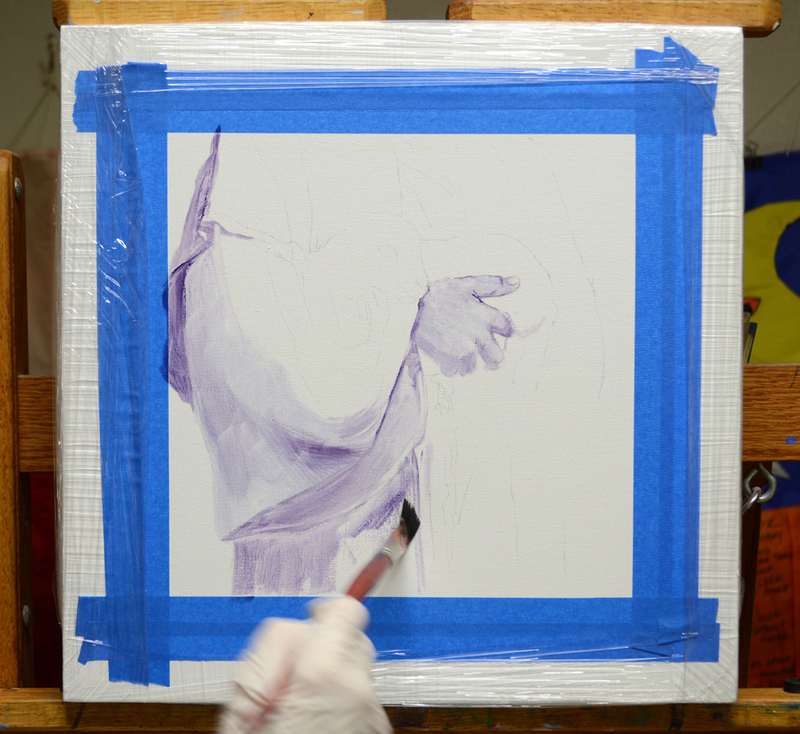 I’ve lightly penciled the figure on the canvas, you may click on the image to see this better. Notice, I haven’t drawn the left hand, I’ll do that in a minute. 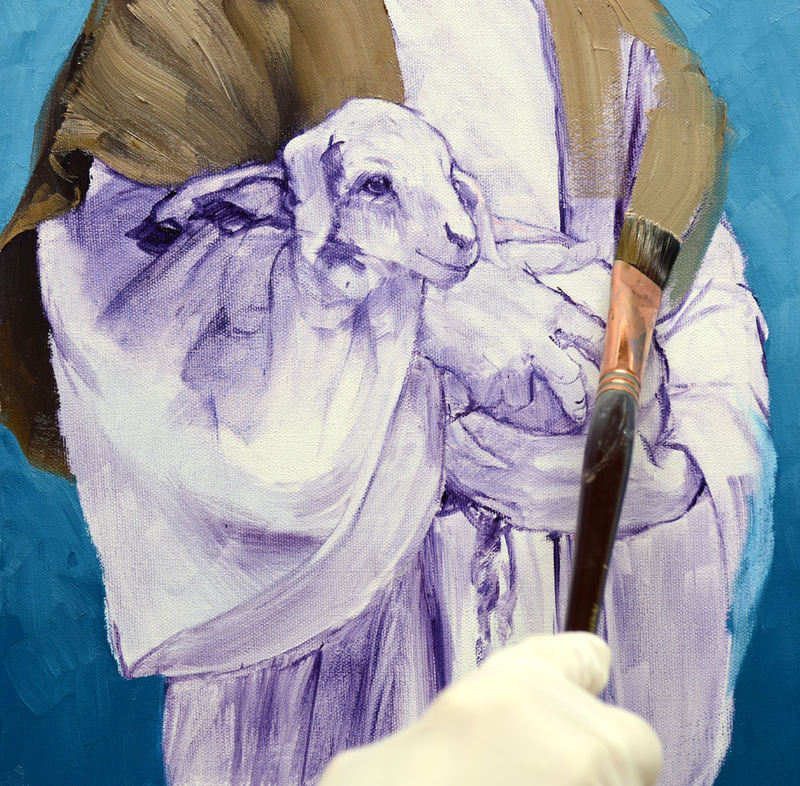 The basic shading of the robe and right hand are washed in using a brush dipped in a thin oil mixture of MUD (2 parts Ultramarine Blue + 1 part Alizarin Crimson) + Liquin. 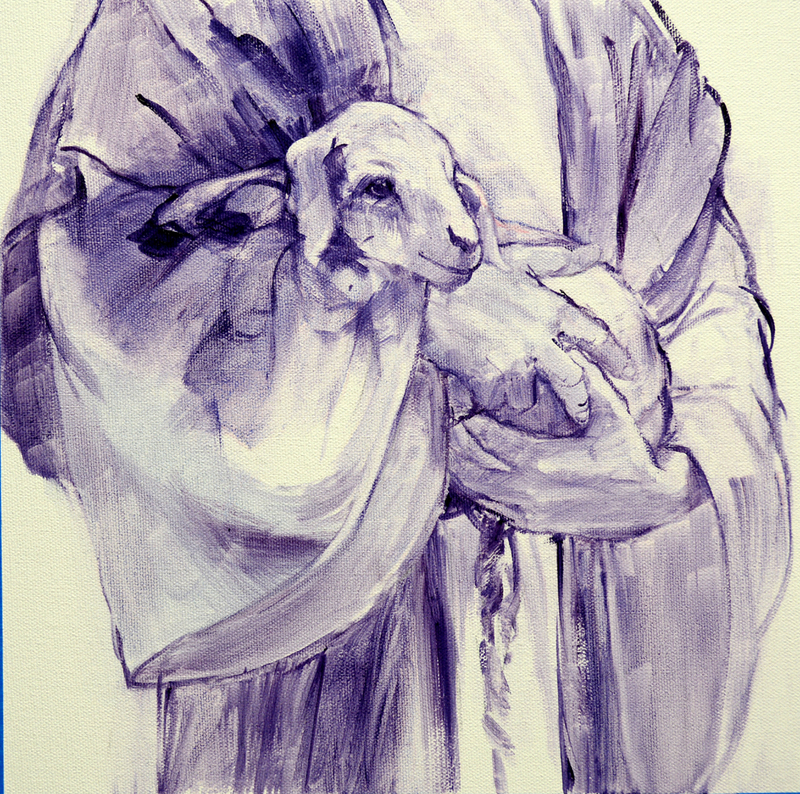 It’s a challenge to get the feeling of the hands wrapped around the body of the lamb. My days of being a Medical Illustrator and the many years of drawing surgeon’s hands in the Operating Room are coming in handy! It’s amazing how all that anatomy popped right back into my brain. 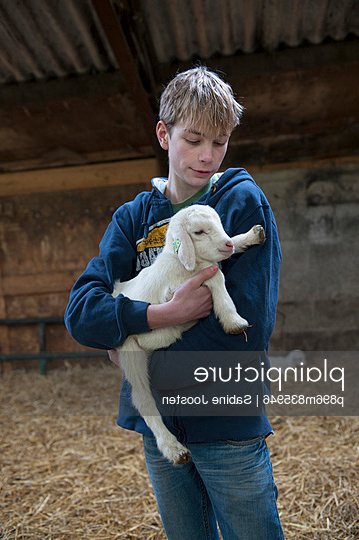 The head of the lamb in the second picture gives me a good reference to work from. I want him facing Jesus’ hands, bringing the viewer’s attention to them. Our oil wash sketch on the canvas is complete. 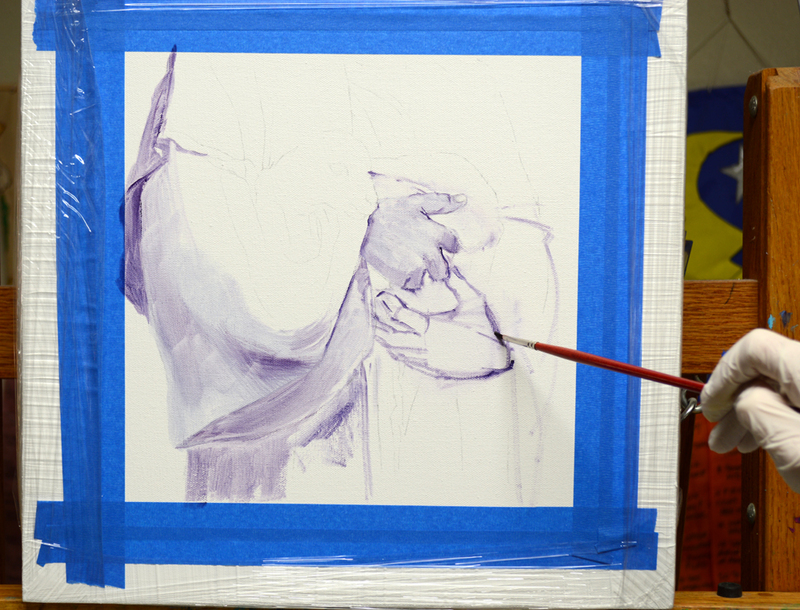 I’ll begin applying the opaque color in our next session. Hope you’ll come back and follow along. I’ll even have a couple of video demonstrations! If you would like to receive an email every time I publish a new post please feel free to subscribe to my blog. CLICK THIS LINK and scroll to the upper right side of the page. You will see a heading EMAIL SUBSCRIPTIONS. Just enter your email address and click the button “Sign me up!” It’s easy. 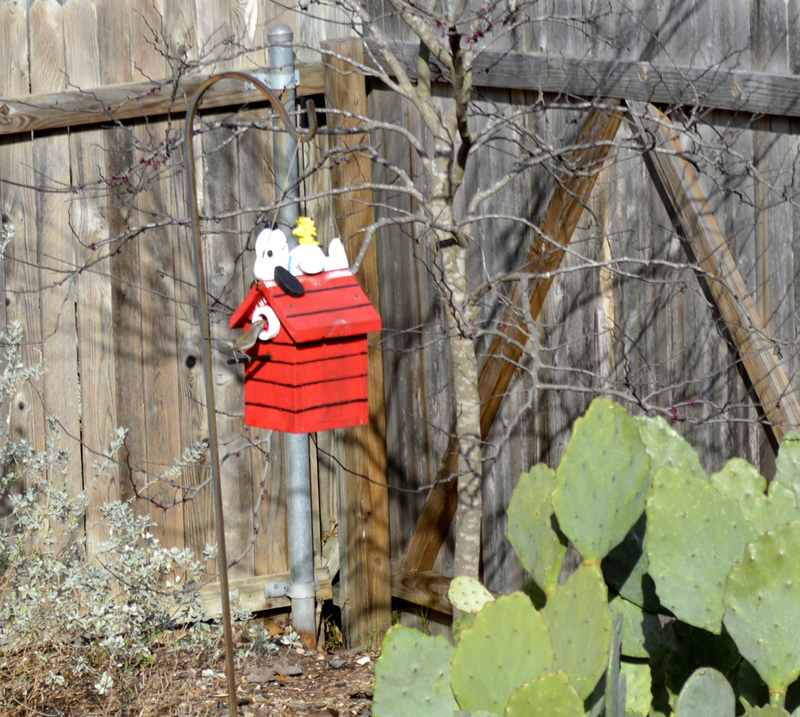 I guess I should have said, “A wren is raising her babies in Snoopy!” We have a really cool Snoopy birdhouse given to Jack and me by a dear childhood friend of mine. 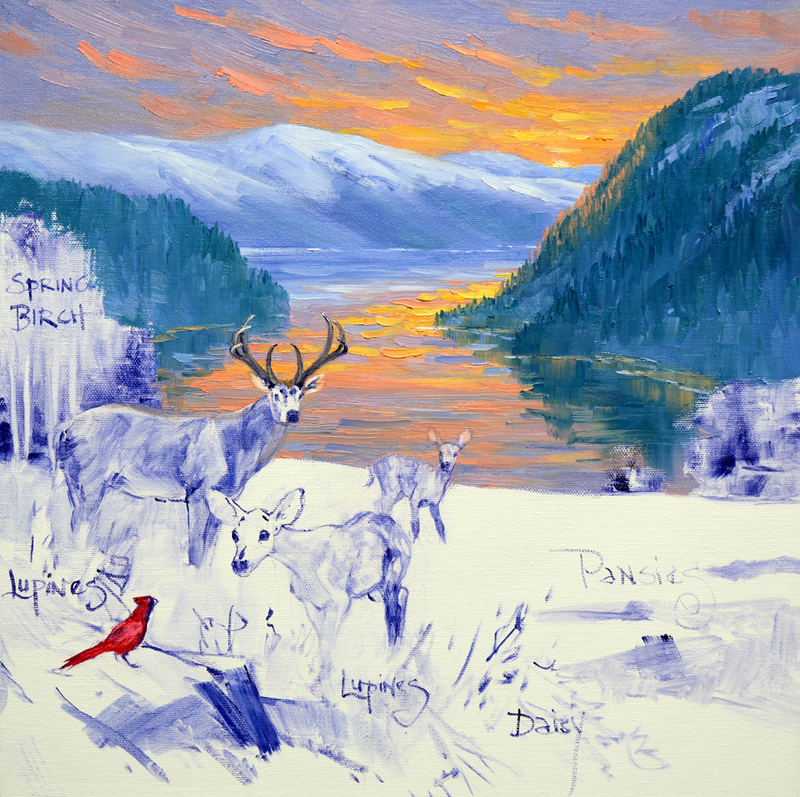 Paul and his wife, Nancy, are also collectors of both Jack’s and my paintings. As I was working in the garden I could hear the frantic chirping of the chicks as Mama came to feed them. Try as I might I couldn’t get a picture of the goings on. The moment I pulled out the camera, Ms. Wren vanished and the young ones became silent! I did, however, get a picture of Ms. Wren checking out the birdhouse back in February. So this will just have to do! Now, let’s get back to work embellishing “Vista of Joy”. Here’s a comparison of the White Daisies before and after the embellishing process. You may click on the image to see it larger. Geraniums are next. 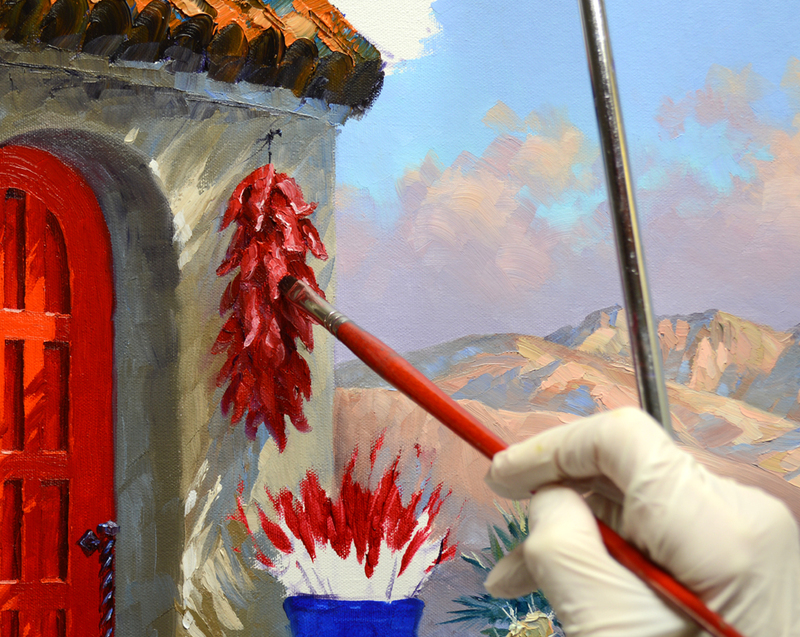 The fluffy blossoms are painted with mixes of Cadmium Red Deep + Alizarin Crimson, Cadmium Red Deep and Cadmium Red Light. Mixes of Pthalo Blue + Lemon Yellow are used for the leaves. 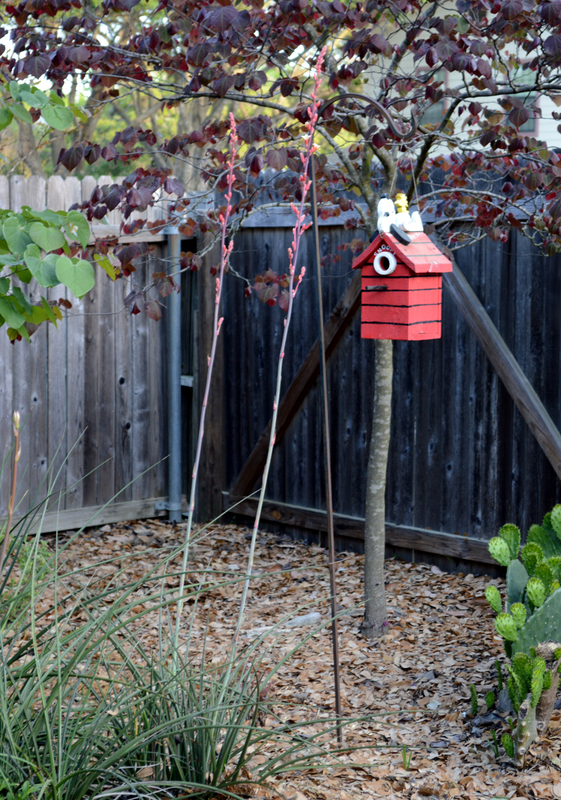 Permanent Rose + White is perfect for the Hot Pink Hollyhocks. 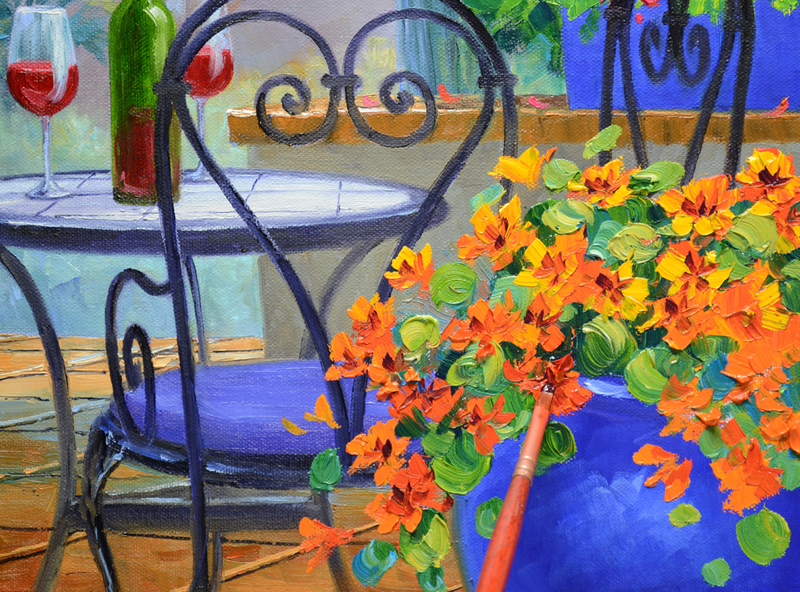 The foliage is reworked with combinations of Pthalo Blue + Cadmium Yellow Medium. 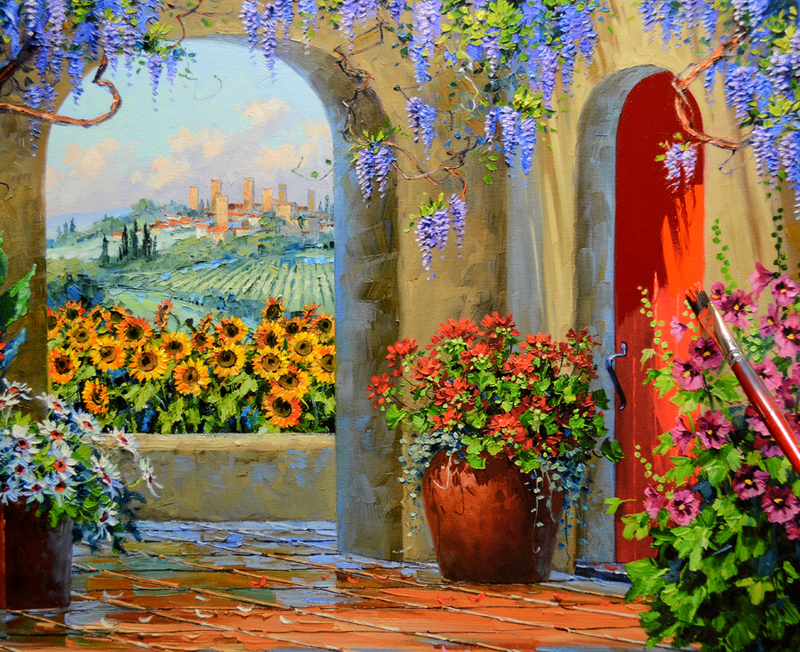 Our Tuscany piece will do some international traveling before it arrives at its final destination. 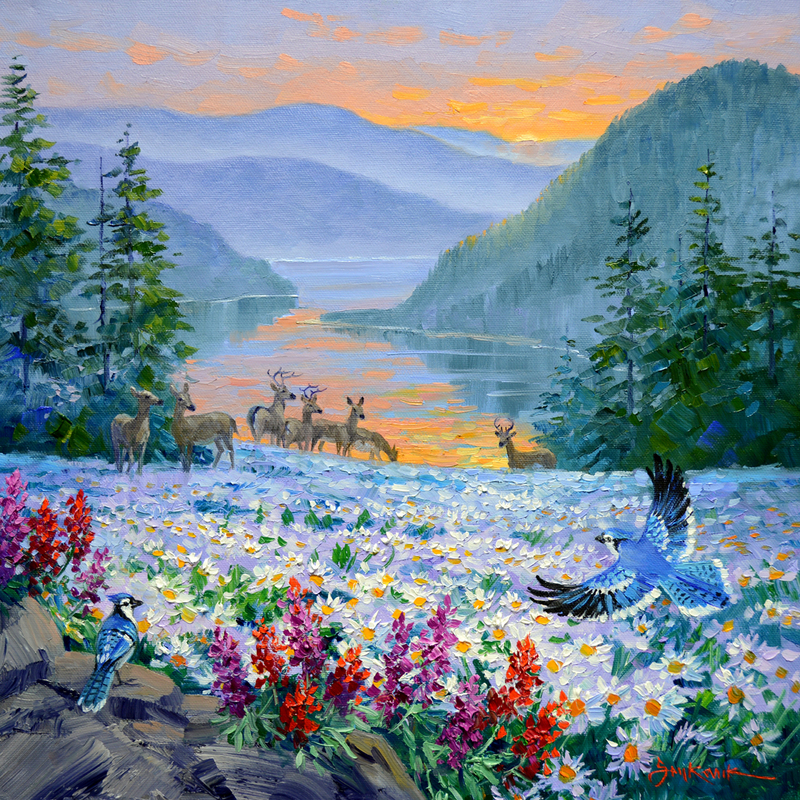 “Vista of Joy” is headed to my collector’s home in Canada! After a few days to dry it will be off on its journey! Thought you’d enjoy seeing a close up so you can compare the changes. This reminds me of those little games in the newspaper I loved when I was a child, “Find the Differences!” Have fun and please remember, just click on the image to see an enlargement. HUGS! 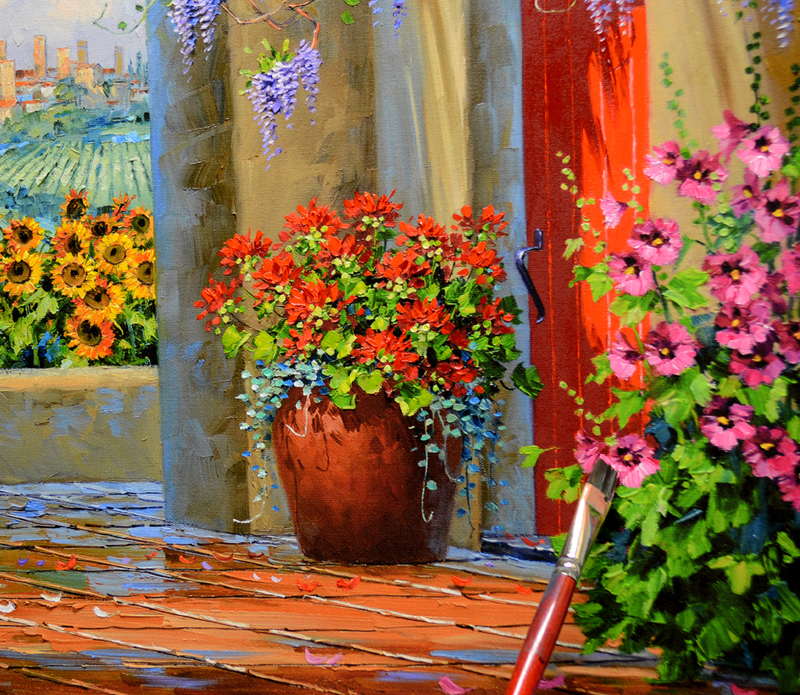 Today I’m embellishing one of my Limited Original giclees on canvas. 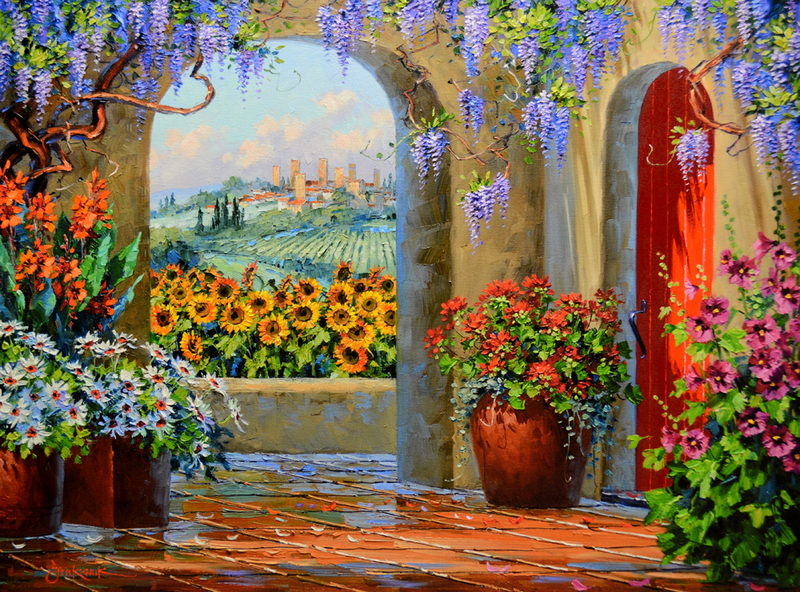 This is a high resolution digital reproduction of my original oil painting “Vista of Joy”. 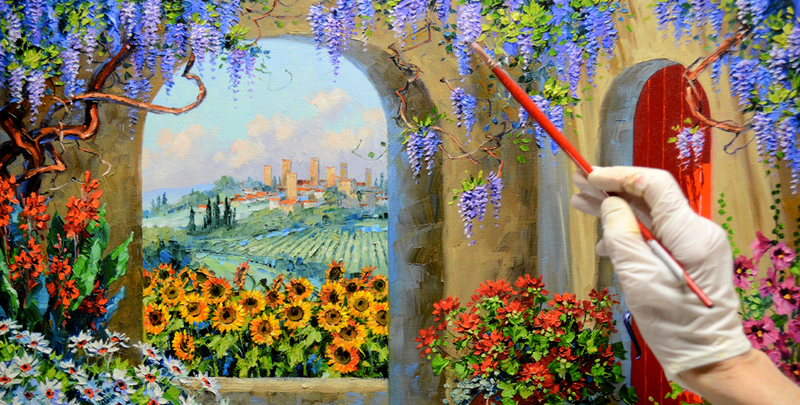 My collectors love Italy, this piece will remind them of happy travels in Tuscany. Above, the piece is shown before I begin working. It’s framed in our Senkarik/White Signature Frame which has been shrink-wrapped. Then the edges around the image were taped off to keep the frame nice and clean. 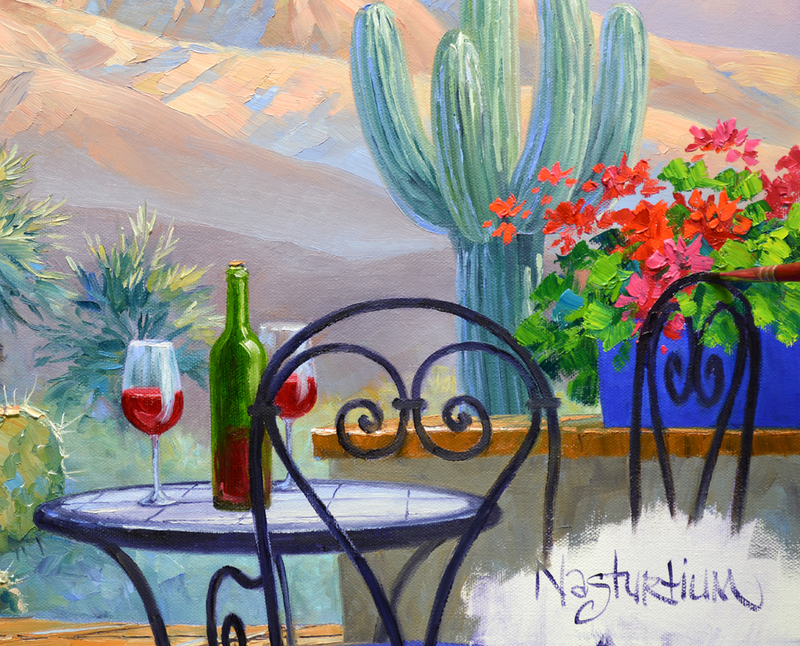 I use Alkyd Oils to enhance my Limited Originals. 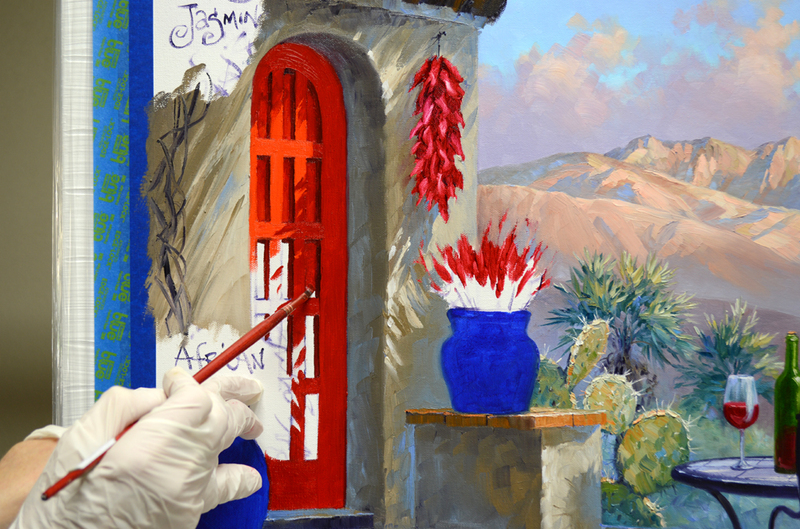 They are exactly like regular oil paints with the same colors and workability; the Alkyds just dry more quickly. The first step is to accentuate the sunlit portions of the clouds. 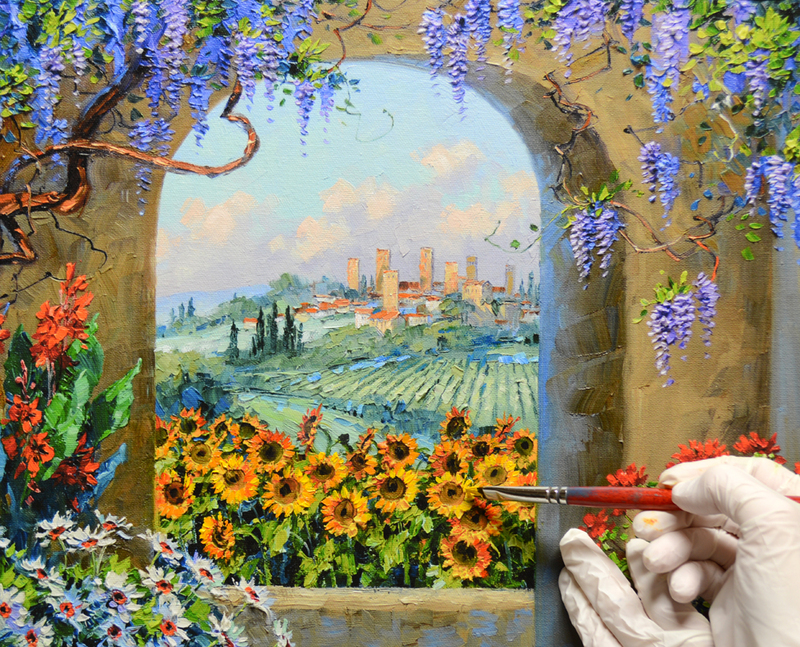 After repainting the towers and distant fields of San Gimignango I paint the large blossoms of the Sunflowers, adding lots of texture. Please keep in mind as you read through my blog that you may click on this, or any of the other images to view them larger. Now the door is painted, you can see how much more intense the red becomes. Just compare the upper portion of the door to the lower, non-embellished, part. Wisteria blossoms are delineated with mixes of Dioxazine Purple + White and Dioxazine Purple + Ultramarine Blue + White. There’s more to do……you’ll see that in the next session. I hope you’ll come back and watch. I’ll even have a video for you! If you would like to receive an email every time I publish a new post please feel free to subscribe to my blog. CLICK THIS LINK and scroll to the upper right side of the page. You will see a heading EMAIL SUBSCRIPTIONS. Just enter your email address and click the button “Sign me up!” It’s easy. 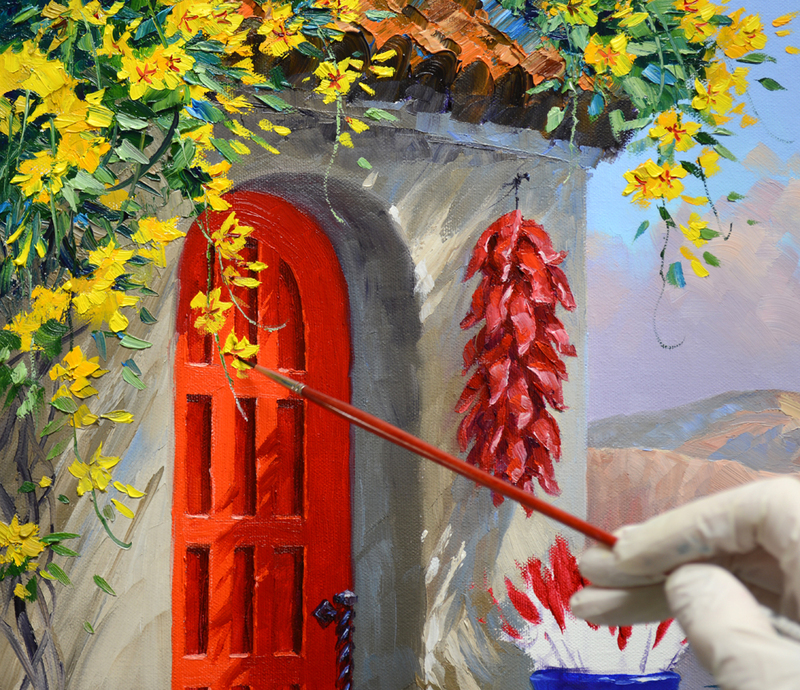 I’ve NEVER painted Carolina Jasmine before, so here goes…… The blossoms are mixes of Cadmium Yellow Medium + MUD (2 parts Ultramarine Blue + 1 part Alizarin Crimson), Cadmium Yellow Medium + Cadmium Lemon and pure Cadmium Lemon. The leaves are Pthalo Blue + Cadmium Yellow Medium + Cadmium Lemon + White. You may click on this, or any of the other images to see them larger. 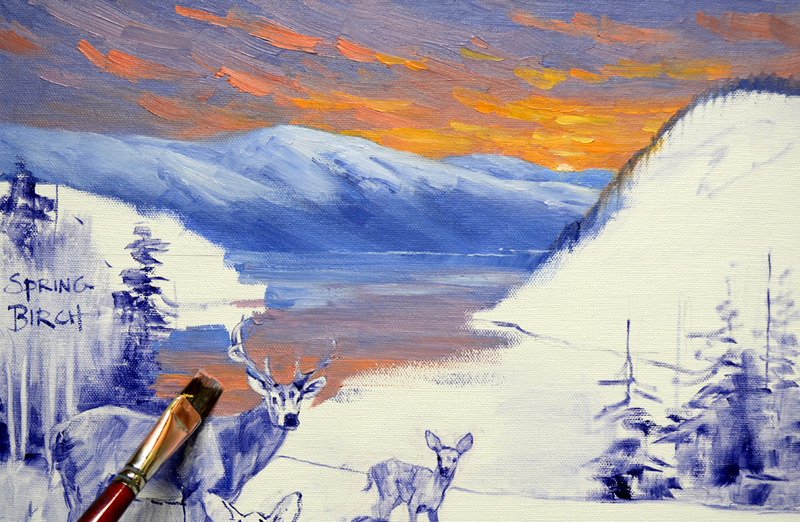 The centers are drawn with a #1 round sable brush dipped in a mixture of Alizarin Crimson + Liquin. 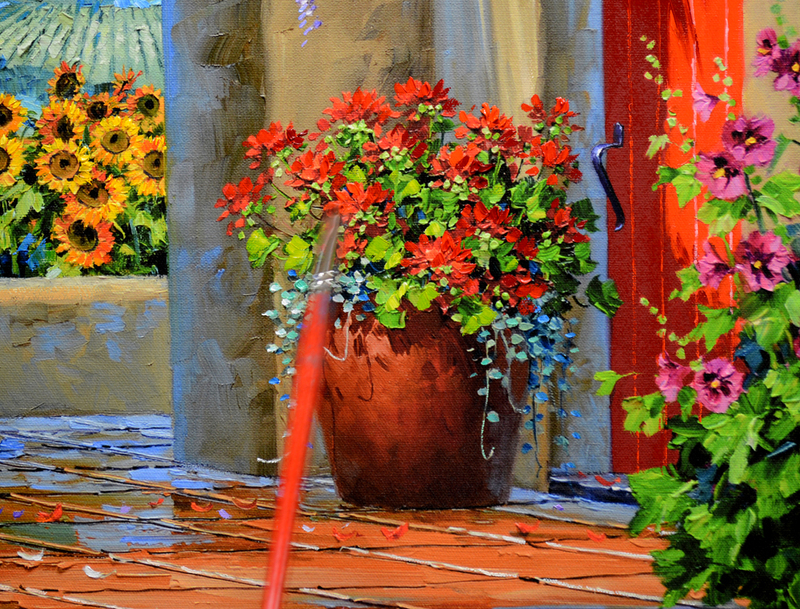 The Red Geraniums are combinations of Cadmium Red Deep + Alizarin Crimson, Cadmium Red Deep and Cadmium Red Light. The Pinks are made of several shades of Permanent Rose + White while the broad leaves are Pthalo Blue + Lemon Yellow. The back of the chair is drawn into the wet paint of the flowers and leaves with a mix of MUD + Liquin. White is added to the leaf color to delineate the distinctive flower buds of the Geraniums. Nasturtiums tumble out of the large ceramic container in the lower right corner. 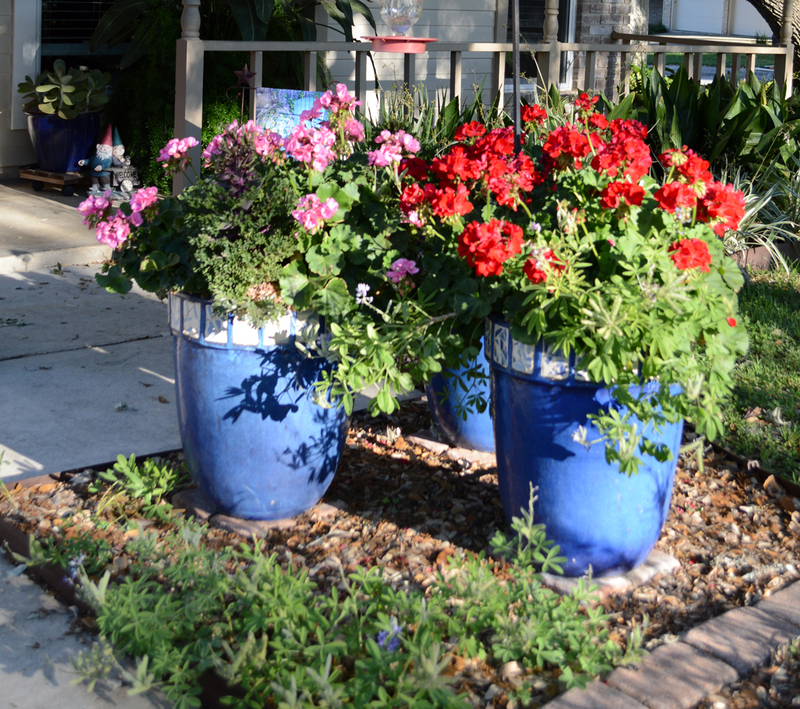 The bright Oranges POP against the complimentary Blue color of the pot. Now that we’re finished you can see how all of the warm colors on the terrace cause the cooler hues in the distance to drop back. 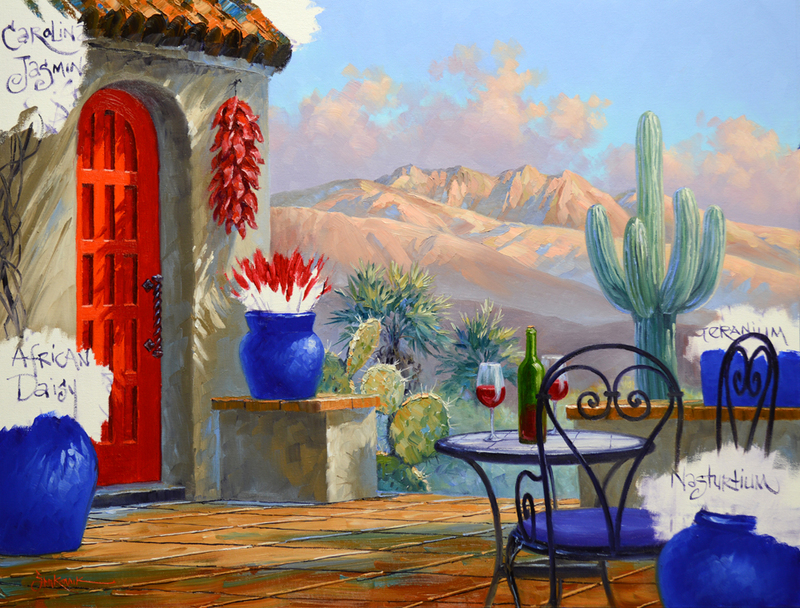 “Four Peaks” is ready to head to its new home in Scottsdale! I’d like to thank every one of you for your kind comments about the article Erkan wrote. I didn’t realize Erkan was a young man until he responded to my blog on the last session that said “She”. OPPPSS! 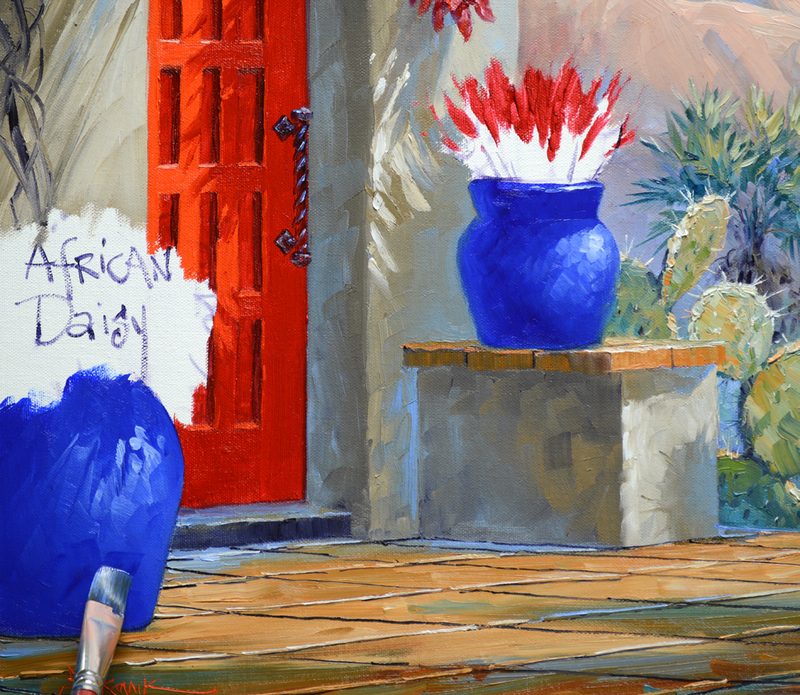 I had checked on this very talented artist’s website for pictures of “The Artist”. I didn’t see any so I just guessed Erkan was a lady. My fault for not asking. But this is a good lesson for all of us. First…..have pictures of yourself on your website. Collectors love to “meet” the artist, you’re more real if they can see pictures. Second….if you don’t know something, JUST ASK! 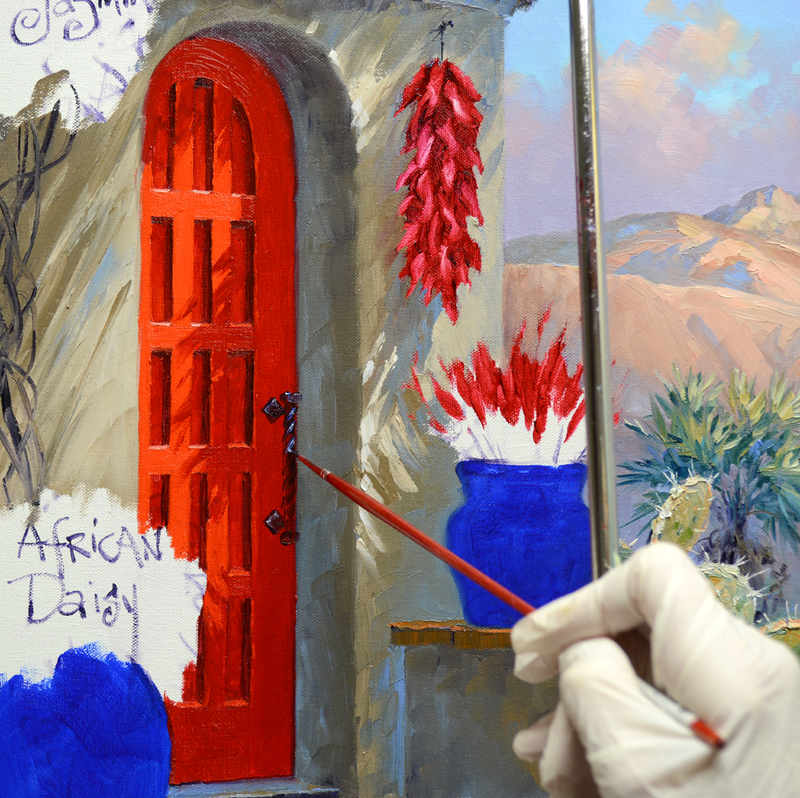 I’m using my collector’s beautiful, natural wood front door in the painting but we’re adding a special twist. Suzanne and I decided it would be fun to make it RED! With 15 inset panels it takes a little planning to get it all lined up! After drawing the outer panel I divided the door into 5 equal parts from top to bottom. The next step was to indicate the horizontal and vertical cross pieces. 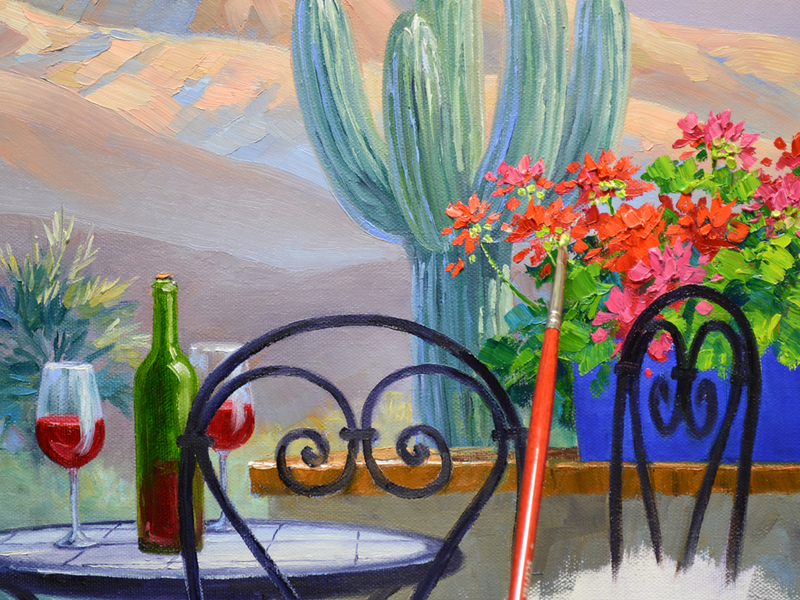 Shadows are mixes of Cadmium Red Dark + Alizarin Crimson and Cadmium Red Dark. 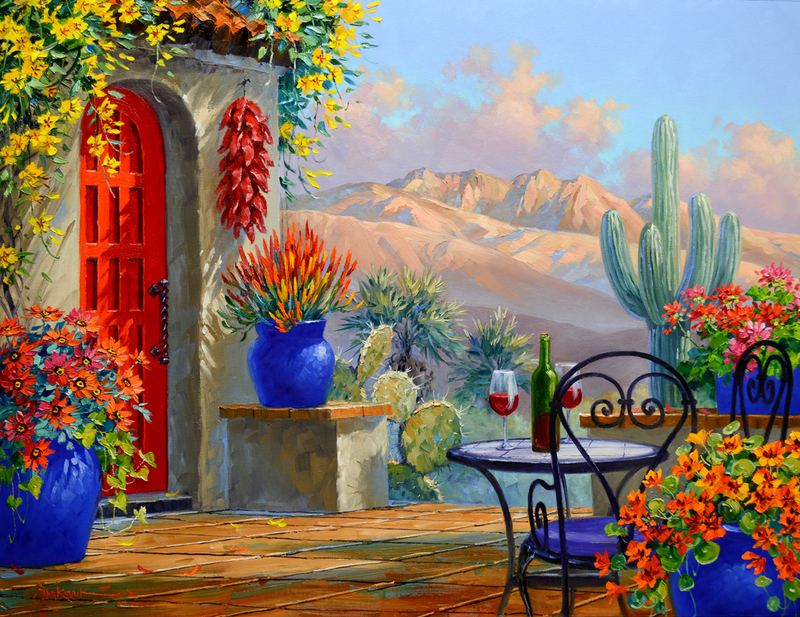 The sunlit portions of the door are pure Cadmium Red Light. We’re also adding their unique wrought iron door handle. 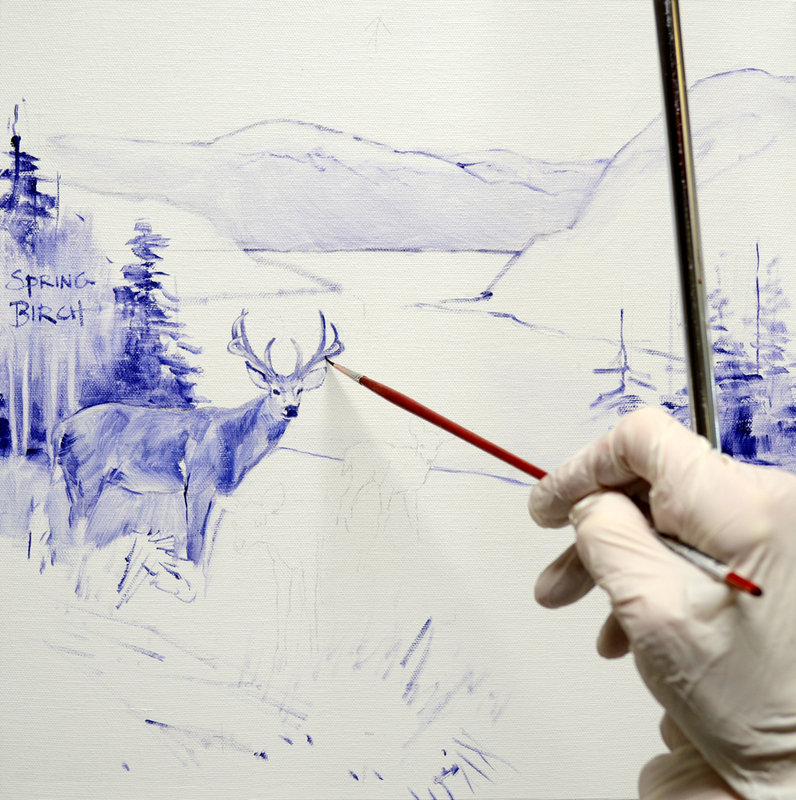 MUD (2 parts Ultramarine Blue + 1 part Alizarin Crimson) + Liquin is used for the basic dark color. 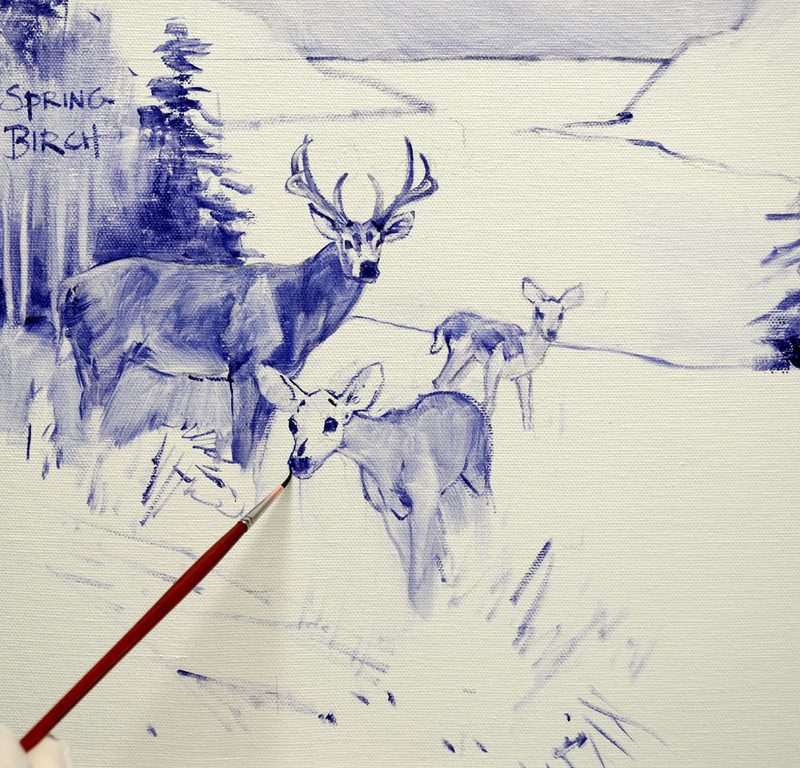 Then highlights are made with two shades of White + Ultramarine Blue. Please remember, you may click on any of the images to see them larger. 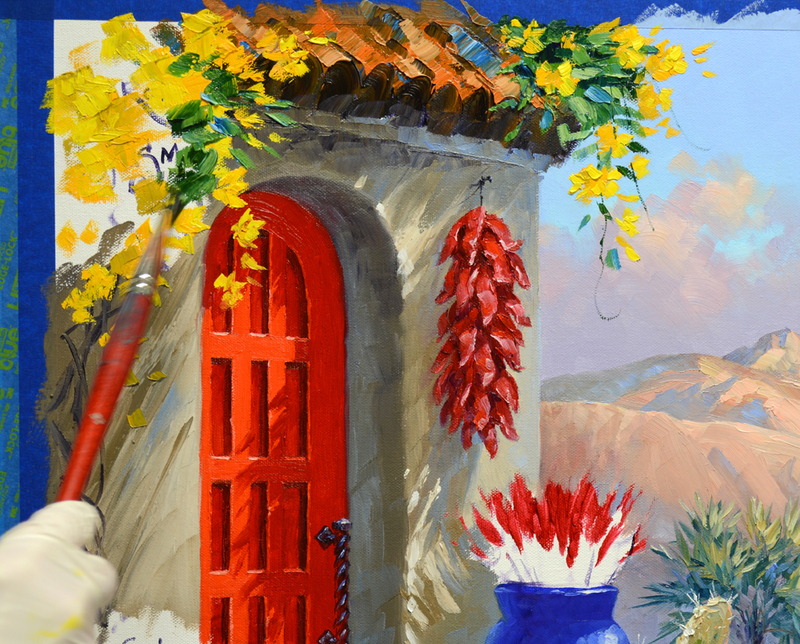 The individual Chili Peppers are delineated in thick brushstrokes with combinations of Cadmium Red Deep + Alizarin Crimson, Cadmium Red Deep and Cadmium Red Deep + White. 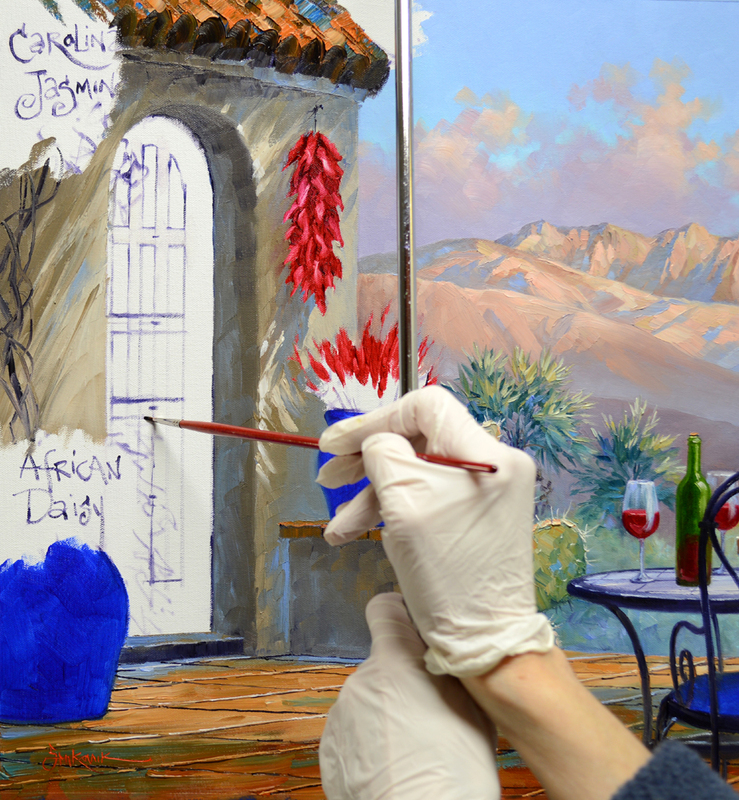 Now the large ceramic containers are painted with mixtures in various shades of Ultramarine Blue + White. All that’s left is planting! We’ll be doing that in our next session. So, make sure to come back and see how our completed terrace looks! AND……If all goes well I hope to have a couple more videos for you. But before I go I’d like to tell you about a special honor I’ve received. Erkan Yildiran, a 34-year-old artist from Austria, wanted to spotlight my work on his website as Artist of the Month! I’m overwhelmed at his insightful, beautiful article. To read it, CLICK HERE. Thank you Erkan!